The Giving Forest cabin and wilderness area, including half of the shoreline of Young Lake, is a retreat area, free for use by anyone who reserves it. 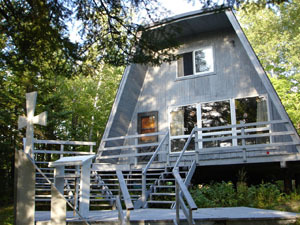 The property includes a two-story A-frame cabin powered by a generator, a hiking trail system, playground, and boat dock. There are two campfire areas with benches, a large screen house, picnic tables and a meeting and worship area overlooking the lake. Part of the outreach mission of the Church is encouraging the use of Giving Forest by others. Scout troupes, youth groups, retreat groups, hikers, and nature lovers, artists, and individual family groups from several different cultural organizations and congregations have enjoyed the opportunities which the Forest provides. Dates you would like to reserve. The name, address, and telephone number of the adult leader who will be in charge of your group and responsible for keys, cleanup, etc. Approximate number of people in your group. Take Highway 53 north towards Cotton, MN. Approximately 15 miles north of Cotton, turn right on West Melrude Road. Continue for 3 1/2 miles to Cemetery Road (Township Rd. 6663). Turn right and continue about 1 1/2 miles to the cabin.